Work on the project has been progressing smoothly for the past month. Colin has now completed the cataloguing of the Bartram & Sons ships plans we hold and has started work on the plans of the Sunderland shipbuilding firm of John Crown & Sons Ltd. While Colin has been keeping out of mischief (mostly), I’ve been working on the records of Austin Pickersgill Ltd and its two predecessor companies, S.P. Austin & Son Ltd and William Pickersgill & Sons Ltd. 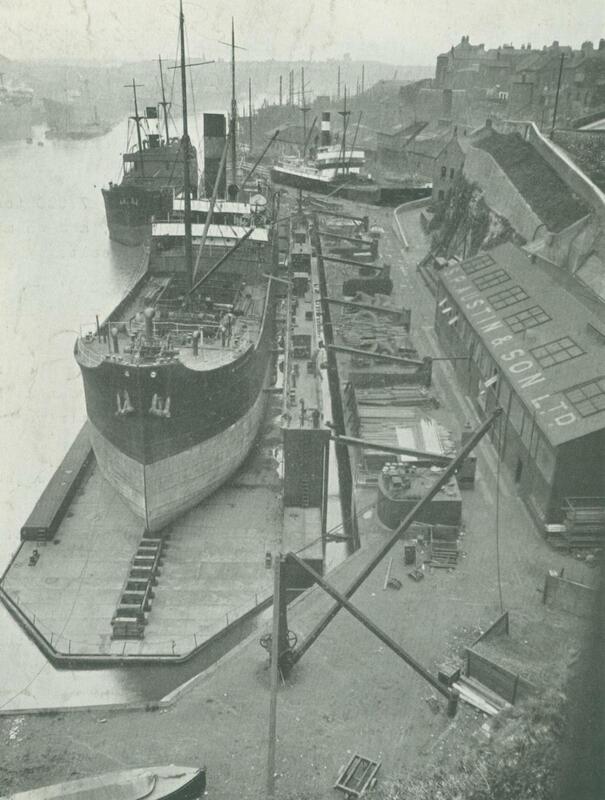 Most of the documents catalogued so far are typical of the shipbuilding records we hold and include annual reports, hull and engine specifications, contracts and ships cost files. However, a number of slightly unusual documents have also been unearthed. By a strange coincidence these all touch on the topical subject of credit. Of particular interest is a series of records relating to the iron barque ‘Mary Roberts’, launched by William Pickersgill & Sons in 1887. The vessel was built for the Liverpool shipowner Richard Hugh Roberts. However, when Mr Roberts defaulted on his payments to Pickersgills in 1888 the firm set about repossessing the vessel. With the agreement of the ship’s other shareholders Charles Pickersgill was appointed manager of the ‘Mary Roberts’ and personally travelled to Hamburg in October 1888 to take possession of her. The ‘Mary Roberts’ completed its scheduled voyage and was then sold in December 1889 against the wishes of the previous managing owner, Mr Roberts. It appears that Charles Pickersgill may have been pretty ruthless in his dealings with Roberts, who certainly had hard feelings about his treatment. In a letter to William Pickersgill & Sons in 1892 Roberts wrote, “I have suffered false imprisonment … and every calumny owing to your intrigues with Thomas & Messrs Sloman & Co to say nothing of your interference with my private estate & business”. The shipowner’s difficulties are also mentioned in a letter by Charles Pickersgill dated 11 February 1889 (TWAM ref. DS.WP/2/1/5) in which he passed on a report that Roberts was “still in a Lunatic Asylum”. 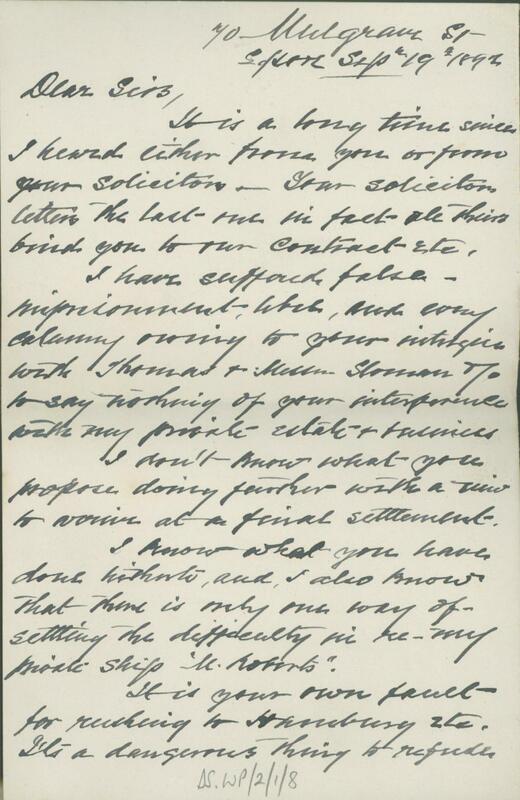 On the other hand, letters written in August and September 1888 (TWAM ref. DS.WP/2/1/3) by Captain Owen Lewis, the master of ‘Mary Roberts’, paint a slightly unflattering picture of Roberts’ behaviour and he certainly doesn’t appear to be blameless in his misfortune. The events surrounding the repossession and sale of the ‘Mary Roberts’ are intriguing and I hope that further research might one day shed more light on them. The records of S.P. Austin & Son Ltd also contain a number of unusual items. 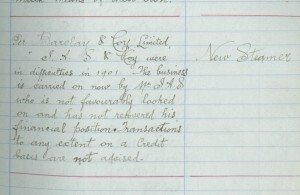 A document that particularly caught my eye is a register of enquiries of the credit status of potential customers, kept between 1884 and 1927 (TWAM ref. DS.AP/3/4). The vast majority of the entries give a positive account of the potential clients. 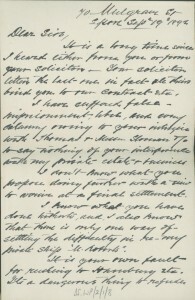 An interesting example is the entry dating from 17 September 1902 for C.S. Swan & Hunter of Wallsend, who were interested in ordering a pontoon. The enquiry into the firm’s creditworthiness concluded “that they are safe and have a lot of good work in hand”. History confirms that the firm went on to great things. Not all reports are glowing, though, as is reflected by an entry dating from 26 November 1902 for J.A. Salton & Co. of 31 Lombard Street, London. 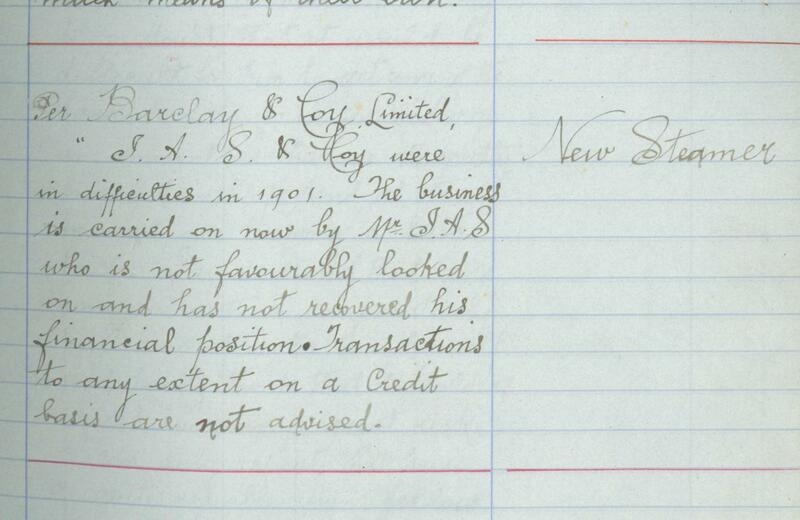 The report sent by Barclay & Co. Ltd mentions that the firm “were in difficulties in 1901. The business is carried on now by Mr J.A.S. who is not favourably looked on and has not recovered his financial position”. This register is also interesting because it includes details of proposed ship repair work. Ship repairing was an important part of the firm’s business but is poorly documented in the collection. 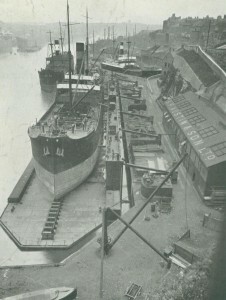 Austins was well known for its Pontoon Dock, completed in 1903, which allowed the firm to carry out larger repair jobs on vessels up to 400 feet in length. Over the next few weeks I’ll be completing work on the S.P Austin & Son and William Pickersgill & Sons collections. These include some interesting personnel records and I look forward to reporting on them in my next blog. I have an early painting of a steamer named Agnes pictured in the harbour of Hong Kong and would like to verify that this is the same ship built by S P Austin around 1900 for Lambert Bros: of London. Would you be able to compare it with any records you hold? Thank you very much for your message. I’m afraid that we don’t seem to have any photographs or plans of the ‘Agnes’, launched in 1900 by S.P. Austin & Son (yard no. 210). If you haven’t already done so then it might be worth contacting the National Maritime Museum to see whether they can help you. Information about their collections can be found on their website http://collections.rmg.co.uk/. You could also try getting in touch with London Metropolitan Archives since they hold archives of the shipowners Lambert Brothers Ltd. Brief details of these and contact information can be found on the National Archives website http://www.nationalarchives.gov.uk/nra/searches/subjectView.asp?ID=B27510. I’m sorry that we can’t help you ourselves. If anything relevant does turn up then I will of course get in touch. Thank you for getting in touch. I’m afraid that we have relatively few records for SP Austin & Son and sadly we don’t have any plans or photographs of the vessel ‘Largo’. It might be worth contacting the National Maritime Museum to see whether they can help you. Further information can be found on their website http://collections.rmg.co.uk/collections.html#!cbrowse. If you are looking for information about the vessel’s crew then you might find the following user guide on the National Archives website helpful http://www.nationalarchives.gov.uk/records/research-guides/merchant-seamen-logbooks-crewlists-after-1861.htm. As you might imagine, I would love to have a photo of the Elizabeth Holland at the yard with hopes of seeing the bell in place. Simple searches show pictures of the Leonidas but haven’t come across any Elizabeth Holland. I looked in the archives you mentioned above with no luck. Thanks for getting in touch. I’m afraid that we don’t have any images of the Elizabeth Holland. If you haven’t already done so then it might be worth contacting Sunderland Local Studies Library to see whether they can help http://www.sunderland.gov.uk/index.aspx?articleid=1092. It might also be worth contacting the National Maritime Museum since they have an extensive photographic collection http://collections.rmg.co.uk/collections.html#!csearch;collectionReference=subject-90518;authority=subject-90518. A check of our catalogue reveals that the only plans we have for those lightships are for yard no. 140. They consist of a general arrangement plan (TWAM ref. DS.CR/4/PL/1/140/1) and a deck plan (TWAM ref. DS.CR/4/PL/1/140/9). You’re very welcome to visit us in person to take a look at these and you can find details of our location and opening times on our website https://twarchives.org.uk/visit-us. If you’re interested in ordering copies of the plans please contact our searchroom team (e-mail: archives@twmuseums.org.uk), who will work out the cost and get back to you. My grandfather, Edward Evans, was captain of the Pelton Company’s Presto, Brio, and Alto, Primo, and the 1911 Tempo. Also of the Rodney Company’s Alice Marie and Rose Marie. I have photographs of the Tempo, and the Alice Marie. I wonder if photographs exist of the other ships. Photographs were always taken at the time of the sea trials. I should be very grateful for any thoughts. Thanks for getting in touch. I’m afraid that we don’t appear to have any images of the vessels you mentioned. However, I notice that two of the vessels (Brio and Primo) were built by the Campbeltown Shipbuilding Co and surviving records for that firm are held by the Argyll and Bute Council Archives. It might be worth contacting them to see whether they can assist you and contact details can be found on their website http://www.argyll-bute.gov.uk/community-life-and-leisure/archives. Sadly we don’t have any photographs or plans for S.P. Austin & Son vessels from that era. You could try contacting the National Maritime Museum to see whether they can help http://www.rmg.co.uk/work-services/contact. It might also be worth contacting Sunderland Museum (http://www.seeitdoitsunderland.co.uk/sunderland-museum-winter-gardens) and Sunderland Local Studies Library (http://discovery.nationalarchives.gov.uk/details/a/A13531504) in case they have any relevant images.